Whatever Happened To Raoul Wallenberg? Welcome to the Whatever Happened to Raoul Wallenberg? book website. 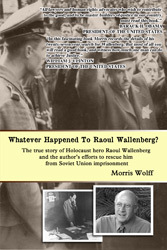 The pages on the site offer background and information regarding the book, its author and the subject of the book, Raoul Wallenberg as well as praise, reviews, articles and other media regarding the book and Morris Wolff's efforts. Click on the links below to visit the pages of the website or use the buttons to the left. To purchase the book Whatever Happened to Raoul Wallenberg? click on the 'Buy The Book' links throughout the site. The book is available through the Educational Publisher Bookstore in both print and digital format. Visit the About the Book page to for description and background of Whatever Happened to Raoul Wallenberg? and to read excerpts from the book. Visit the Reviews, Articles and Other Media page to read reviews, articles and other media for Whatever Happened to Raoul Wallenberg? Visit the Blog page for up to date information about Whatever Happened To Raoul Wallenberg? Click Here to buy the book Whatever Happened to Raoul Wallenberg?